First-time buyers or renters. You have a whole new place to decorate. Where do you start? Second- or third-time home buyers. Whether you’ve gone up or down in size, stayed in the same region or moved to a whole new one, you need to know how to make your old furniture work in a new setting, how to add furnishings, and how to make your style seem fresh. Katharine Kaye McMillan, former senior editor of a New York City-based national magazine, is a writer whose work appears regularly in magazines and newspapers. She is a contributing writer to internationally circulated Florida Design Magazine. She is the co-author of several books on decorating and design, including Sun Country Style, which is the basis for licensed signature collections of furniture and accessories by three leading American manufacturers and importers. A graduate of the University of Texas in Austin, she holds a masters degree in psychology and is a doctoral student in psychology at Florida Atlantic University, Boca Raton, Florida. Patricia Hart McMillan is a nationally known interior designer, whose interior design work for private clients, designer showcases, and corporations has appeared in publications worldwide, including the New York Times and USA Today. Known as a trend spotter and for clearly articulated views on design, she is quoted frequently and extensively in both trade and consumer publications. She a ppears on TV and talk radio. A prolific writer, she is coauthor and author of seven books on interior design and decoration, with Sun Country Style signature collections of furniture based on two books. She has taught decorating courses at several colleges and conducted numerous seminars across the U.S. She is decorating editor for Christian Woman Magazine and reports on design trends for The Sun-Sentinel, a Tribune newspaper based in Ft. Lauderdale, Florida. She has been editor-in-chief of two publications and was head of a New York City-based public relations firm representing some of the most prestigious names in home furnishing and building products. She holds a Bachelor of Arts degree in English, with a minor in art history (with an emphasis in architecture), from the State University of New York (New Paltz). She was awarded a certificate from The New York School of Interior Design. Chapter 1: Bringing Your Vision to Life. Chapter 2: Planning Your Budget. Chapter 3: Evaluating Your Space. Chapter 4: Understanding Design Principles. Part II: Creating Surface Interest. Chapter 5: Eyeing Color Basics. Chapter 6: Applying Pattern Basics. Chapter 7: Feeling Your Way Through Textures. Part III: Style and Substance. Chapter 9: Living with Historic Decorating Styles. Chapter 10: Decorating with Contemporary Styles. Chapter 11: Determining Your Personal Decorating Style. Chapter 12: Finding Out about Furniture. Chapter 13: Creating Wonderful Walls. Chapter 14: Finding Fabulous Floors. Chapter 15: Sprucing Up Ceilings. Chapter 16: Dressing Up Windows. Part V: Tackling the Three Tough Rooms: Kitchen, Bath, and Home Office. Chapter 18: Cooking Up Your Dream Kitchen. 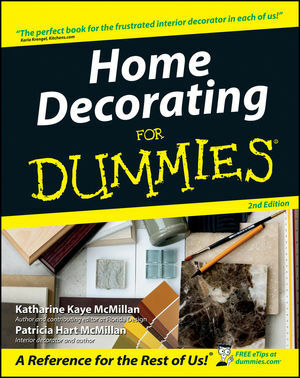 Chapter 19: Beautifying Your Bathroom. Chapter 20: Setting Up Your Home Office. Part VI: Fixing Up Four Easy Rooms. Chapter 21: Styling Serene Bedrooms. Chapter 22: Creating Your Living Room. Chapter 23: Designing for Dining. Chapter 24: Transforming Bonus Areas. Part VII: Embellishments: Accessorizing with Art and Other Stuff. Chapter 25: Acquiring and Arranging Art. Chapter 26: Accentuating Your Style. Chapter 27: Ten Quick and Easy Centerpieces. Chapter 28: Ten Tips for Leftover Wallpaper. Chapter 29: Ten Favorite Sources.